A tent is your home away from home. And if you want your outdoor experience to be as comfortable as it possibly can, then great care must be taken on your tent. After all, that’s where you recharge for the adventures that await you the next day. So, in this article, we’ll show you how to care for tents from the time you set them up to the time you store them. How to Care for Tents? Find a smooth, level ground to pitch your tent. Sharp objects and unnecessary strain may damage the tent floor. Set up the tent under a shade. Direct exposure to sunlight can cause the tent’s fabric to become brittle over time and tear easily. So, try to find a spot where it can be avoided. Using a rain fly can also minimize the damage that the elements can do to the tent. Use a ground cloth or footprint under the tent. If you have a rain fly for the top, then there’s a ground cloth for the tent floor. Use it to protect the tent floor from abrasion as well as to keep it from collecting dirt or rainwater. Leave footwear outside the tent. This helps keep out the mud, stones, and other debris that can potentially damage the tent. Keep food outside the tent. The smell of food beckons critters to your tent, and they will try to gain entry at any cost—including making their door to your tent. Use non-detergent soap to clean mud or grit. If there’s any stain or dirt on your tent that you need to remove while it’s still in up, then use a wet sponge and mild soap for cleaning so as not to spoil the tent’s protective coating. Be ready for emergency repairs. For small tears or cuts: Use duct tape as a temporary band-aid. Replace with a tent patch when you have the time. For split seams: Use a seam sealant to repair it. For broken poles: Try to have a replacement pole on hand for such events. If that’s not possible, then improvise a splint using duct tape and some sturdy material. Clean the tent from the inside. Brush or sweep the floor, and remove anything stashed in the compartments. If you have the time and when the weather is ideal, then you can clean the walls or dirtied areas with mild soap and water. If you’re in a rush, then you can do this at home. Keep the entrance open an hour before you start taking the tent down to release any smells trapped inside. If you don’t have the time as of the moment, then you can do it at home. Open tent doors and windows when you start taking down the tent. This will prevent air from getting trapped inside. Start in the middle when you take down the poles. Doing so evenly distributes the tension and prevents damage to the poles or the internal cord. Take inventory of all the parts. Before packing everything into the storage bag, make sure you have the right number of pegs, poles, etc. 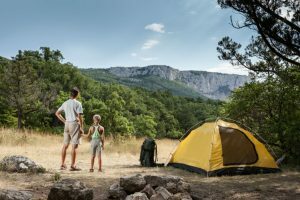 How to Store and Maintain Tents? Clean the tent after every use. If you didn’t have time to do this during pack-up in camp, then make sure to pitch the tent back when you get home. Remove dirt and stains with non-detergent soap and lukewarm water. Do this manually; never machine-wash your tent. Don’t delay cleaning the tent. What’s worse than having to clean your tent after a long trip? A stinky, moldy tent that you may never be able to use again! Even if the sun is nowhere in sight, make sure to clean the tent. You can let it hang to dry in a garage. It’s an equally bad idea to let it dry next to an artificial heat source or leave it under direct sunlight. Make sure everything is thoroughly dry. If you don’t want to be greeted by a moldy or musty tent the next time you open it, then let the tent dry or air out properly. Don’t skip cleaning the tent pegs, poles, and other metal parts. Rinse tent pegs with water and have a separate bag for them. Wash tent poles as well, especially if you had a seaside or oceanside camping trip. For the zippers, give them a quick dip in the water. Make sure to dry all metal parts before storage as well. One of the tent parts that often get damaged is the zippers. It can get caught on a piece of the tent and, of course, you can lose your patience in the process of your trying to get it unstuck. To avoid such scenarios, wax your zippers to get them working properly. And, of course, pack on some patience, too! When condensation starts to build up inside your tent, or when rain doesn’t slide off the fabric, it means it’s time for it to get some re-waterproofing. Schedule re-waterproofing on a sunny day, so that the tent dries properly before packing and storage. Most products need 24 hours to dry thoroughly. Keep account of the parts, from the rain fly down to the footprint and pegs. Make sure everything is complete and ready for your next camping trip. After cleaning and drying your tent, find a place that doesn’t encourage mold or mildew to set in. The basement, attic, or car trunk may not be good places to store it. Store it flat and loosely. Avoid storing the tent, together with the poles, in an upright position. Storing it flat will keep the poles from piercing through the fabric. It’s also important that you pack the tent loosely to allow air to circulate and keep it smelling good. Use the tent bag as a carry sack, not as permanent storage. Allow tent fabrics to relax and breathe. Store the tent in a cloth bag. Well, that’s quite a lot to remember. But after a few camping trips and remembering to apply these tips on how to care for tents, it will come to you almost intuitively. And when you do, you’ll have your trusty tent to accompany you for many adventures.